The European Medicines Agency's (EMA) RSS feeds allow you to stay up to date with the latest news and features you are interested in from this website. To subscribe to these feeds, you will need a news reader or other similar device. New content is automatically delivered to your news reader. To learn more about RSS and news readers, see our RSS user guide. 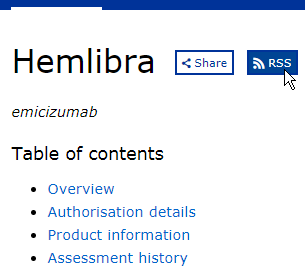 EMA also provides RSS feeds for all centrally authorised medicines. To subscribe to these, click on the RSS feed icon on the medicine page next to the medicine name at the top. RSS, or Really Simple Syndication, is an XML-based format for content distribution on the internet. It is an excellent pipeline for internet users to get the updated news content and online articles that they want without having to search for them. RSS feeds allow you to see when websites have added new content. You can get the latest updates in one place, as soon as they are published, without having to visit the websites you have taken the feed from. Most modern browsers allow you view and subscribe to RSS feeds straight from the browser. They also allow you to add RSS feeds as a browser favourite, automatically updating them with the latest content. Some e-mail service providers give the option to receive the RSS feed subscriptions as e-mail notifications. There are also many free, web-based readers, all of which compile and update feeds. For heavier users, there are desktop, application-based clients, which offer more features.